After taking the charge of T20 world cup, Dhoni was the front runner for the bigger seat.............captainship of the ODI team. Now it is official, he is the captain. But the big question arises is that, can be a successful captain? Specially in the presence of Big Three ..........Sachin, Saurav and Rahul.In the past Azaruddin has to faced this kind of situation when he was named the captain of a team having 5 former captains.But situation is quit different in Dhoni's case. Dhoni is quit junior to the Big Three with only 80 odd matches under his belt..........while big three has a combined experience of around 1000 matches.One can't deny this fact that there would be EGO problem. Can Dhoni tell to the Ganguly .........go and field at the boundary, when he wants to field at slips? Or can he tell Sachin and Saurav to bat at 5 or 6 when they want to open the innings? I don't know. But what I know is that he has to do it if he thinks so.........then only he can prove himself as a captain. 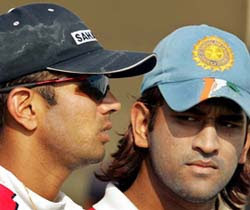 One more issue I want to discuss is that Yuvraj has got more experience than Dhoni, why Dhoni is preferred over Yuvraj. I guess Yuvraj is more regular member of the ODI team than any other member in the team.Then why Dhoni not Yuvraj.........Can any one give me the answer? Well our selection criteria is always full of surprises, this is just little one of them. Dhoni has got tough assignment to start with....Aussies and then Pakistan. For me these two teams are the toughest to beat in ODI's. Dhoni is captain for probationary period of two series. He has to show his calibre in three roles........wicket keeper , Batsmen and CAPTAIN. Can he prove himself to the expectations?